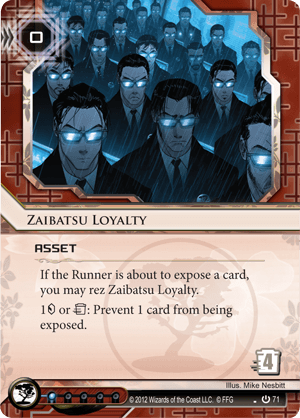 If the Runner is about to expose a card, you may rez Zaibatsu Loyalty. 1credit or trash: Prevent 1 card from being exposed. As stated in an early article, expose is one of those design areas that simply has not been explored very much. While there is a runner who works around it, she is no where near popular enough to pack a card like Zaibatsu Loyalty. Although expose is very strong against the Jinteki Shell Game, very few people put expose cards into their decks when building for all-comers. Until expose becomes a more consistent, often used effect, this card will remain with low impact on the game. That all being said, besides the effect being lackluster it is an excellently designed card. It is one of the few cards that is an interrupt effect in Netrunner, that alone gives it an amount of power. Its zero rez and four trash cost is a great ratio, especially for the core set, and makes a lot of runners hesitant to pay that cost. Even better than that, many similar powered cards have their ability as a trash cost - Zaibatsu Loyalty has that as an option, but can even be powered by credits. At only one influence it could find its way into any deck that wanted expose protection. Unfortunately, if the runner has no expose abilities it is a dead and useless card. If Expose was a more used mechanic, Zaibatsu Loyalty would be an insanely powerful card for the way it is designed. Unfortunately, the mechanic is so very underused that this remains a niche card to tech against certain decks or local meta’s, and does not find much of an impact outside of that.